Speaking of the most important things in your iPhone that you probably want to and need to make a backup of, the long list of contacts and messages undertaking the sweet moments with your loved ones surely rank to the top. As to other files like music, videos, apps and many more, you can re-download them on your phone all over again, but it is pretty challenging and troublesome to get back the lost contacts and messages if you don't have a backup. There are various reasons to explain that having a phone backup of these important files actually do nothing but good. 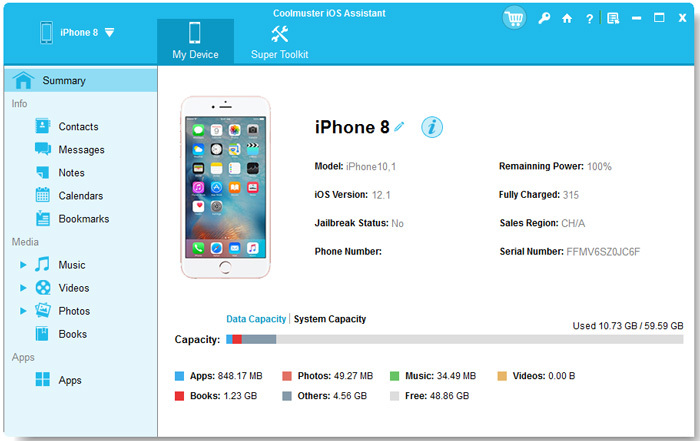 After backing up contacts and messages on iPhone, you are totally free from troubles of sudden data losses since you've already made a phone backup; you can easily transfer these vital data to your new iPhone that you purchased yesterday without the need to typing the long contacts list to your new device one by one; you can effortlessly recover the lost contacts and messages to your broken, water-damaged iPhone. So how can you easily back up contacts on iPhone, as well as messages? No doubt, you can turn to iTunes or iCloud for help. But they are not the perfect choices for you. For example, iTunes doesn't allow you to selectively back up contacts and SMS on iPhone and iCloud only offers 5GB storage capacity for free. So here you have an easier and safer way. Why not give it a try? To easily and safely back up contacts and SMS messages on iPhone, you surely can't miss this Coolmuster iPhone Contacts Backup (Windows/Mac), which allows you to effortlessly back up iPhone contacts and SMS messages to the computer as a backup. Generally speaking, this software is much more powerful than iTunes and iCloud backup. For example, it is fully compatible with other files like music, photos, apps, notes, reminders and many more can be widely supported. Also, different generations of iPhone, iPad and iPod can all be compatible. You are totally free to backup important files to the computer, the external hard drive, USB flash drive as needed and wanted. > Open the installed software on the computer and then get your iPhone connected to the computer via the USB cord. This software will detect your device and show you the below interface where all file folders are arranged on the left panel. 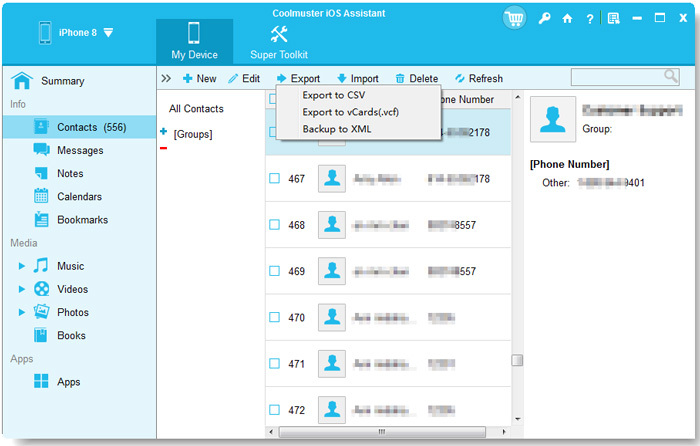 > Now, enter the Contacts and SMS tab respectively to preview more detailed file information. While previewing, select the files you want to back up to the computer by ticking them out. Finally, hit the Export option to transfer wanted contacts or SMS messages to the computer as a backup. This Coolmuster iPhone Contacts Backup (Windows/Mac) makes it as easy as pie to back up contacts and messages on iPhone. So if this is exactly what you are looking for, just get the powerful tool and follow the tutorial!